As a fully fledged Francophile I was delighted to come across Crêpe Street yesterday while in Fremantle with mon amie française Marie. The energetic Jean Luc Gilbert below who makes the crêpes in the French culinary tradition with fresh and quality products states 'to smell and to savor our crêpes is to travel for a while into the heart of the terrior of France.' It is true that for a while, in the middle of the day in Freo I was indeed transported to the 4th Arrondissement, I wish :) Happy Friday, take care and stay safe.. P.s. mon amie française Marie highly recommends the Monaco, the special of the day below! There was a time when the Bell Tower, middle of shot above, was the prominent feature on the city foreshore.. now monstered above and below by 'the customer is never wrong' Ritz-Carlton, due to open mid 2019.. The best view now is looking down Barrack Street from the city.. Remember when it looked like this below! Taken two years ago when Elizabeth Quay was shiny and new and the Ritz was but a twinkle in the developers eye :) Happy Thursday, take care and stay safe..
Black swans are incroyably elegant as they sail along on the water. Here at Floreat Lakes I followed mum and her four cygnets along the way where they met up with dad below. Taking his place at the head of the group they sailed majestically around the bend and out of sight..
You might have noticed that the male (cob) is slightly bigger than the female (pen) but it was the female below that at one point turned and glared menacingly at me to warn me I was getting a little too close to her bubs for her comfort.. I did back-off, have you ever been chased by an angry swan.. it's not fun :) Happy Wednesday, take care and stay safe..
Love, love, looove the whimsical wonder here created last week on the Walter Road water pump station in Morley by Perth contemporary artist Peter Ryan, so much so that I took many photos making it all the more difficult to choose which to show here :) A collaboration between the Water Corporation's Splash of Colour project enhancing their facilities around the city, the Morley Momentum and the City of Bayswater. This area is up for beautification in the future, it is off to a delightful start. Happy Tuesday, take care and stay safe..
We were heading for Coogee Beach Marina but missed the turn-off and were almost at Rockingham before P would admit we were lost and turned on the GPS, never again will we come South of the river without technical help :) but I did rather like this shot as we drove past the Alcoa refinery, I call it 'when nature meets industry' :) the smoke from the refinery funnels almost indiscernible from the clouds in the sky! We left home with time to spare and arrived three quarters of an hour late.. better late than never oui :) Happy Monday, take care and stay safe.. I spotted the gentleman above playing his guitar from a distance, it wasn't until we got much closer that I realised he was singing also. What a perfectly peaceful place to strum and hum. I think he sensed our presence so we walked quietly past so as not to intrude. If I was going sing this is where it would be.. for quite different reasons :) Hope you are enjoying your weekend, happy Sunday, take care and stay safe.. When the news, social media, computers are interfering with my peace of mind, a walk in the great outdoors is an enjoyable way to clear the head and restore the equilibrium. There are a few ways to approach the walk around Floreat Lakes this way was a first for us, it definitely won't be the last. Isn't it pretty. Possibly because it was a mid-week morning it was just we and the birds, lots of birds. It's possible I'm not done with this walk :) more tomorrow. What do you do to restore the balance? Bon weekend, take care and stay safe..
With a little help from my friend.. Always on the lookout for a new view of the city.. the Australian darter above, after swimming underwater across the lake, climbed out onto the grass, spread his wings to dry off, twisted his astoundingly bendy neck to look directly at me as if he was alerting me to the view 'there you go mate, no worries' 😉 Robert Lynd said 'in order to see birds it is necessary to become a part of the silence'.. I'm working on it :) Happy Friday, take care and stay safe..
wind braces us up, snow is exhilarating! There really is no such thing as bad weather.. Yesterday was ice-cream kind of weather in Perth, a gentle hint that official summer is just days away. Ice cream from Gusto Gelato at Elizabeth Quay is a delicious way to prepare for the much warmer days ahead. When you put together a post do you sometimes feel a sense of déjà vu? Guess when you do a almost daily blog it's bound to happen 🍨 Happy Thursday, take care and stay safe.. P.s. BIG catch-up today. Row like there's no tomorrow! A few weekends ago during Open House Perth we stopped in to the West Australian Rowing Club, here next to Barrack Square since 1906. 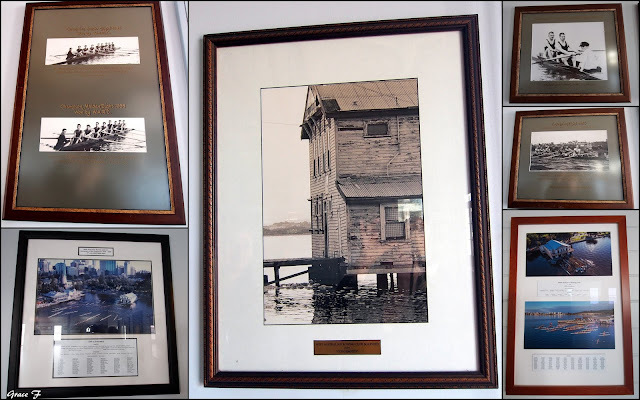 The WARC, the last rowing club remaining on the Perth city foreshore, was almost demolished in the 1960's, surviving only to fall into disrepair (see middle pic below) in 1990. 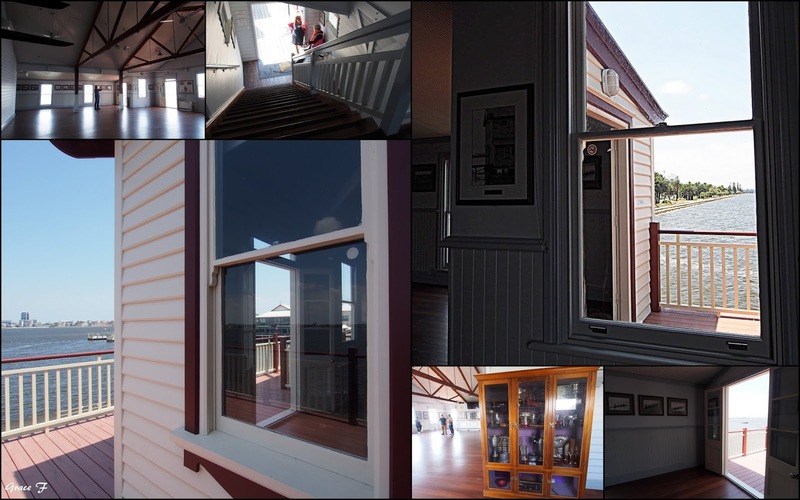 After serious rallying saved the club it was put on the Register of Heritage Places in 2001 as 'highly significant as the last remaining building representing a diversity of recreational, social, industrial and transportation activities carried out on the river and foreshore during the first one hundred years of the colony.' Phew! Apart from the amazing views the old photos above were a highlight for me.. Looking down Riverside Drive below.. Here looking back to the city and Rubra On The Swan, not too shabby a spot to have breakfast! Hope you're having a good week, happy Wednesday, take care and stay safe..
Often while exploring lanes in the city and suburbs I come across random pieces of unsigned art that I feel should get recognition for the work that goes into them. Found in Subiaco the paste-up above is intriguingly intricate.. a space invader or insect of the worldly kind.. who knows but meticulously done. The adapted crack in an old wall just made me smile, I mean, I would have been tempted to do the same :) Happy Tuesday, take care and stay safe..
Sami to see more Monday Murals from around the world.. Walking through the Supreme Court Gardens last week I couldn't resist a quick shot of the two ladies scooping up fallen jacaranda flowers to shower over the young lady, while the photographer snapped away.. the young boy to the left of the shot looking a little bemused by it all :) How do you feel about jacarandas? Read here how Hamish Hastie feels about the, not native to Australia jacarandas, made me laugh out loud 'in the jacaranda suburbs a nice Sunday of naked gardening is off the cards with all those drones buzzing overhead'. He does have a point. The pic below taken on the same day in my garden of the Australian native bottlebrush tree, it has it's own charm, especially as right now it is chock a block with rainbow lorikeets hanging like jewels from the branches.. you will have to take my word that here were two on this very branch seconds before I took the shot :) Happy Monday, take care and stay safe.. The evening Perth Makers Market in Yagan Square in the city is always popular at any time of the year, here on Friday evening the market had a distinctly Christmassy feel to it, to be expected I guess.. seriously where did this year go! Food trucks, cafes, restaurants and pubs were packed on this warm almost summer evening as workers, below, poured out of their offices to start the weekend. 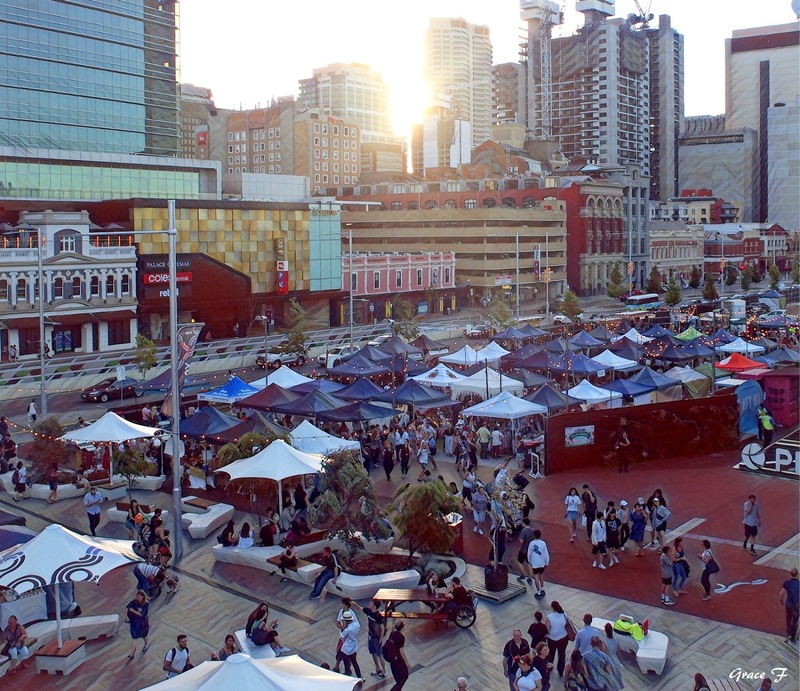 This wasn't the only market in the city on Friday evening, over in Forrest Place the Twilight Hawkers Market markets were busy also.. love to see the city bustling like this. Hope you are enjoying your weekend, take care and stay safe..
Couldn't resist a peek inside Citroenella at the Bonjour Perth festival last weekend. The red/yellow combination attracted me straight away. My very first car was a Morris Minor, hand painted, yup you read that correctly :) red with yellow wheel-caps, known affectionately around town if I hadn't bumped into them as the Noddy car. My car didn't have a wind-up key on the back but it would have been useful at times! Looking at the stickers on the back Citroenella has been around Australia and back however it was the interior contents that made me smile, kangaroo, teddy and 🐤's in a row :) Happy weekend, take care and stay safe..